Think that your Apple account and iCloud service are not secure enough? Well, of course they aren’t, once a security hole gets patched up, there are always someone out there to dig out a new hole so Apple has decided to roll out a two-step verification process to all Apple account and all iCloud services. 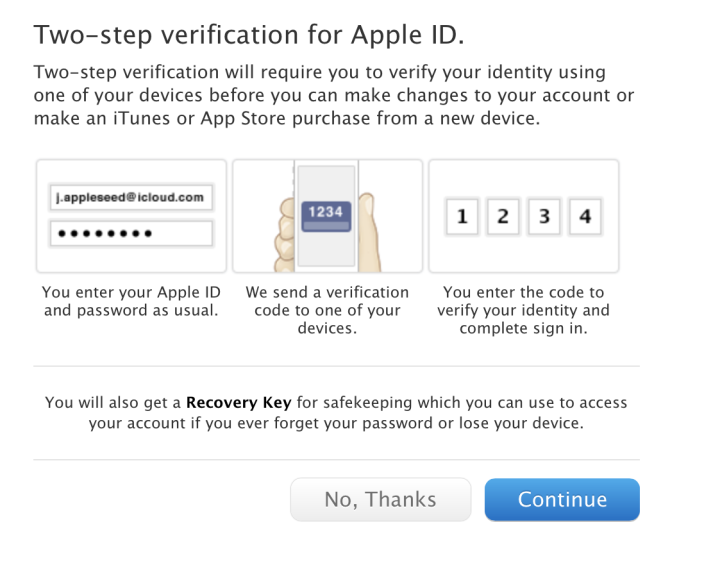 On top of the regular username and password, the new two-step verification process will require you to key in a security code that will be sent to you via SMS or via the Find My iPhone app for any of your iOS device. It will be used to replace security questions (how secure are security questions anyway? ), that will now only help secure your log in process, but also be used as a Recovery Key for those who forget their password. Of course, this is nothing new at all; in fact, I’ve been using 2-step verification on my Google account for years now. But it’s always good to see some tighter security measures for the important online services that are widely used. The new security feature is only available for users in the U.S., U.K., Australia, Ireland and New Zealand for the moment, but Apple will be rolling it out worldwide in the near future.